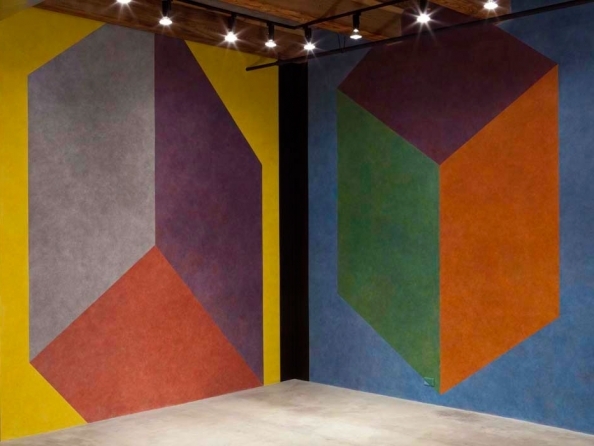 Rhona Hoffman Gallery has exhibited the work of Sol LeWitt since its initiation in 1976. In this exhibition, 8 color ink wash drawings fill the large gallery area. Entitled Wall Drawings #530(s) tilted forms, these works were originally executed at Westfalischer Kunstverein, Munster, Germany in 1987. The wall drawing in the lower gallery, Wall Drawing #469, was originally executed at Rhona Hoffman Gallery in the same year. This installation has been executed by a crew of Chicago artist assistants under the supervision of LeWitt trained artist Sarah Heinemann. Sol LeWitt has had over 30 one-person exhibitions, and is represented in the collections of major museums worldwide. He has been the subject of retrospective exhibitions at The Museum of Modern Art in New York, the Tate Gallery in London, The Kunsthalle Bern, and the Stedelijk Museum in Amsterdam, among other international venues. In December 2000, the Whitney Museum of American Art hosted an all-media retrospective that originated at the San Francisco Museum of Modern Art and traveled to the Museum of Contemporary Art in Chicago. Sol LeWitt: A Wall Drawing Retrospective, a landmark collaboration between the Yale University Art Gallery , MASS MoCA , and the Williams College Museum of Art, opened to the public in November of 2008 at MASS MoCA in North Adams, Massachusetts. The exhibition will be on view for 25 years and is housed in a three-story historic mill outfitted with a sequence of new interior walls constructed to LeWitt’s specifications. The exhibition consists of 105 drawings that LeWitt created over 40 years from 1968-2007.